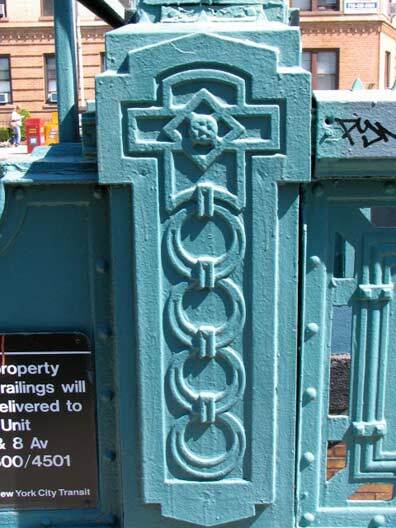 Three boroughs have a major road called 3rd Avenue: Manhattan’s 3rd Avenue runs from Cooper Square north to the Harlem River and officially extends into the Bronx as Third Avenue (it was so named when the elevated train was extended into the Bronx in the 1880s). 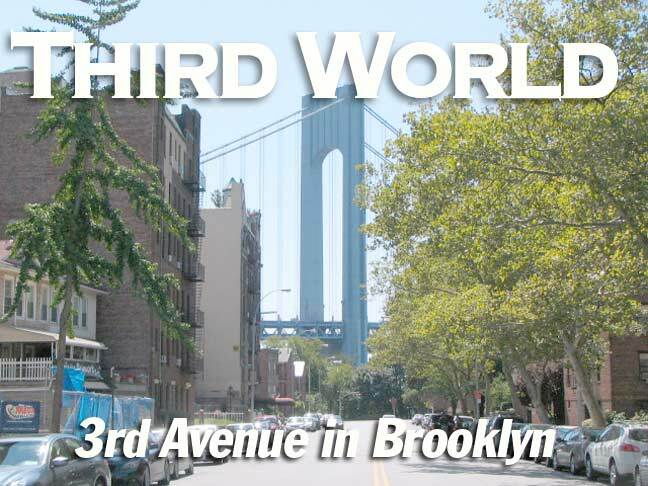 The Bronx even has a second 3rd Avenue in Edgewater Park. 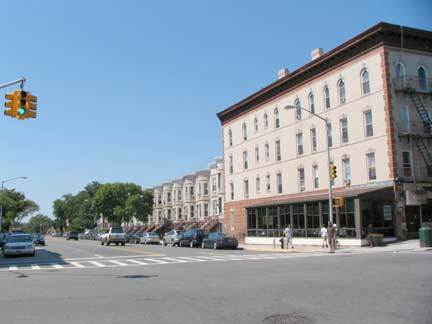 Brooklyn’s 3rd, the subject of today’s FNY page, runs from Flatbush Avenue downtown without interruption all the way to Shore Road in Bay Ridge. 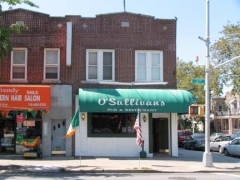 Queens has a 3rd Avenue, as well, but that one only runs for a few blocks in Whitestone. 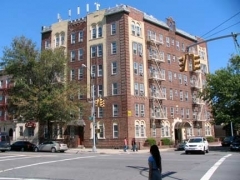 Brooklyn’s 3rd Avenue actually can be thought of as being in 3 separate sections: gritty downtown 3rd Avenue from Flatbush Avenue to the Prospect Expressway; the no-man’s land under the BQE; and the sunny, mid to upperclass 3rd Avenue of Bay Ridge. 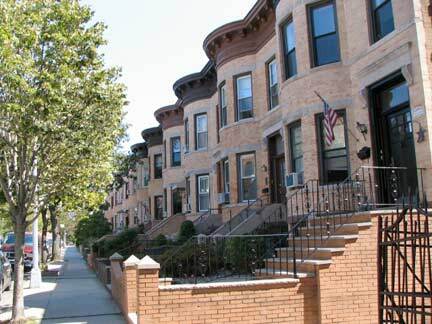 Brooklyn’s 3rd Avenue is one of the oldest roads in the borough, or rather, a straightened version of one of its oldest roads. 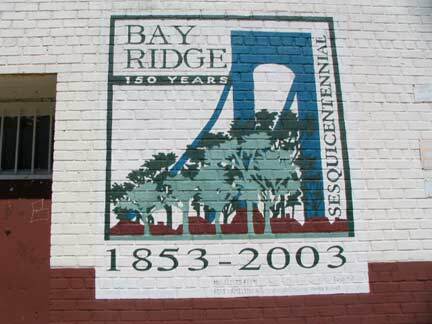 As early as the 1640s there was a wagon trail that ran from the Kings Highway (today’s Fulton Street) southwest to Yellow Hook, today’s Bay Ridge. 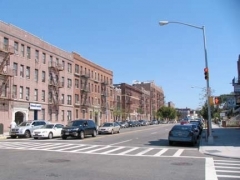 Called the Gowanus Road, it is mentioned in documents going back as far as 1642, when Peter Stuyvesant’s predecessor William Kieft was New Amsterdam’s Director General. The British Army marched along the Gowanus Road in 1776 before engaging the patriots in the Battle of Brooklyn and Lord Sterling and his men fled along it during his retreat. 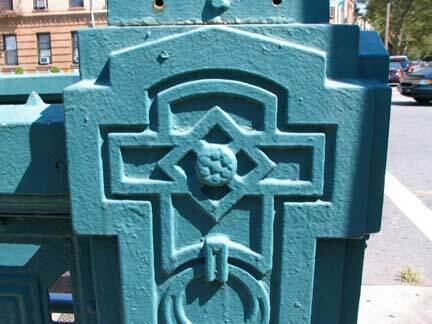 As Brooklyn’s street grid began to take shape, Gowanus Road was closed in sections between 1840 and 1853. 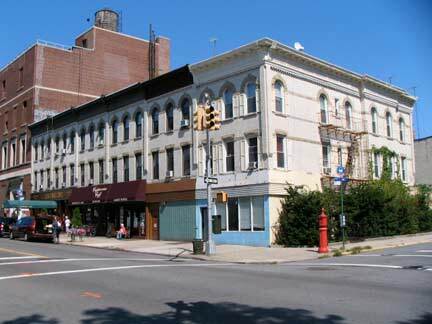 In 1848, the first section of 3rd Avenue proper in what was still the Village of New Utrecht was opened from 60th Street to 79th Street. 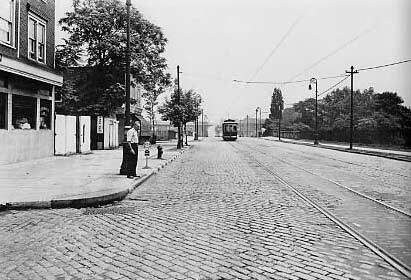 Very early on, horsecar lines and later, trolleys plied the route to downtown Brooklyn. 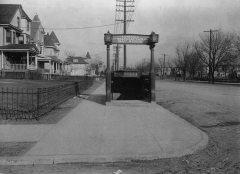 Trolley service, the #37, lasted until 1942 and was replaced by buses; the #37 bus route operated until 2010. 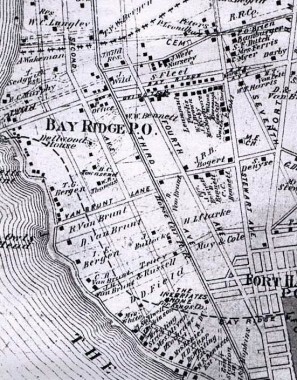 By the time this 1873 map of Bay Ridge was produced, 3rd Avenue’s horsecar line was already in place, but there were still very few cross streets. 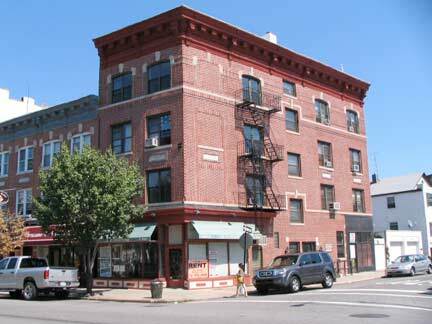 There were centers of population clustered around an artists colony called Ovington Village (Ovington and Bay ridge Avenues had been laid out). Already, the shoreline facing the Narrows was home to a number of imposing mansions facing the water; this was still the resort era, when Bay ridge was a rural enclave by the water. 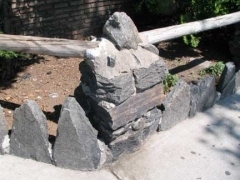 There was also a settlement called Fort Hamilton clustering near the US Government facility built from 1825-1833. 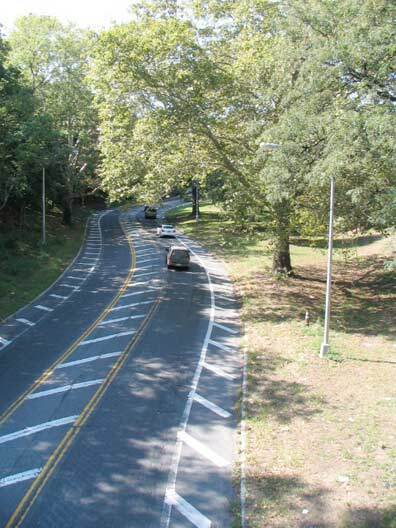 Main east-west routes were Van Brunt Lane (today’s 79th Street). 86th Street appears as a faint line above the “Russell” property listing and was not yet built. Stewart Avenue, a main north-south route, exists only as a dirt road between 71st and 73rd and 71st Street and Ovington Avenue. 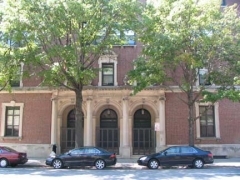 The “Inebriate’s Home” on this map is now the site of the cloistered, walled Visitation Academy on Ridge Boulevard between 89th and 91st Street. The dotted line was a proposed railroad that was never built. 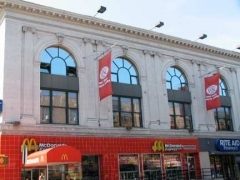 I actually began my 3rd Avenue walk at Flatbush Avenue and worked toward Prospect Expressway, and then a couple of weeks later, went from Shore Road to Hamilton Avenue. I’ll begin here at Shore Road and work my way north. This brick structure on Shore Road between 3rd and 4th has been here likely since the 1930s. 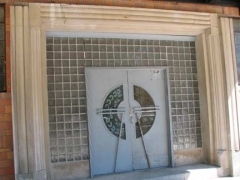 There are defunct men’s and women’s toilets in a basement level. It’s empty inside and was likely built as a way for folks to get out of he hot sun. 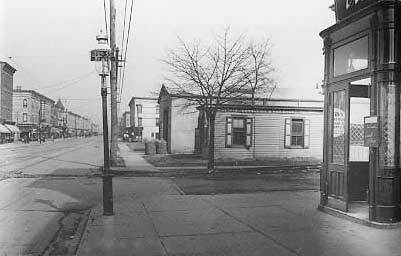 Before about 1940, Shore Road was much closer to the shore than now. After that, landfill was placed to the west and the Circumferential (later Belt, for ease of spelling) Parkway was constructed between Shore Road and the water. The road, though, still twists and turns to follow the shoreline. 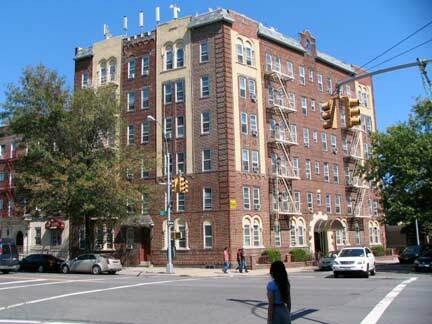 The apartment building at 3rd Avenue and Shore Road gracefully curves on the corner. 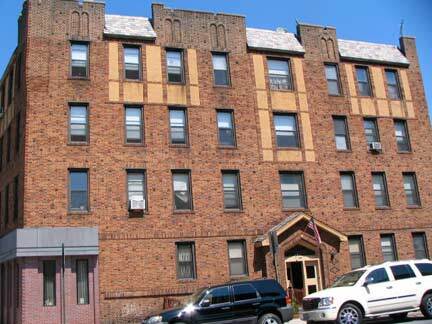 It’s reminiscent of many apartment buildings in the Bronx that do that as well. 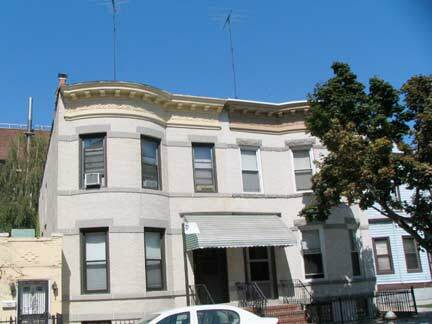 At 3rd and 100th Street we see some rare freestanding houses — rare on 3rd Avenue, that is — and the first of many fine apartment buildings. After the Fourth Avenue BMT subway line opened to 86th Street in 1915 and extended to 95th Street about a decade later, many apartment buildings were constructed to house the burgeoning population. Near the water, they also took advantage of the harbor view. The Verrazano-Narrows Bridge and its approach expressway were constructed between 1959 and opening day, November 22, 1964. Despite calls for mass transit on the bridge, transit czar Robert Moses and his engineers, led by bridge builder extraordinaire Othmar Ammann, made the grade of the bridge too steep to allow heavy rail subway trains to use it. 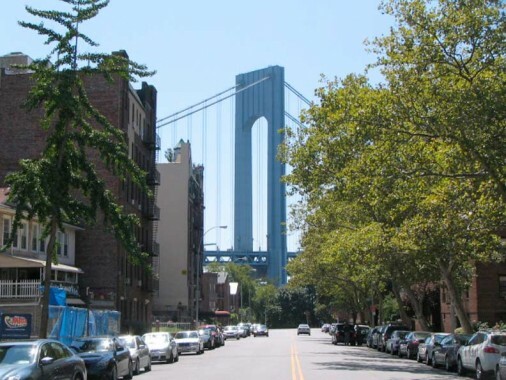 Further, he also pointedly did not make any room for walkways or bicycle paths on the bridge (as he had not done on any bridge since the Triborough (Robert F. Kennedy) since the early 1930s. There remains one way to access the bridge: motorized vehicles. In 2010 the toll was $11.00, $9.14 with EZ Pass. Tolls are collected on the Staten Island side only. ForgottenFan Peter Rosa: Robert Moses may not have been a transit fan, but he’s not to blame for the lack of a rail line over the bridge. 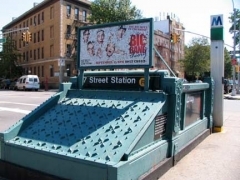 Keeping the grade low enough for heavy rail while also keeping the center span clearance high enough for shipping would have required an immensely long elevated approach on the Brooklyn side. I’ve heard that the approach would have had to be over a mile in length, you can just imagine the negative effects it would have had on the neighborhoods involved. I witnessed the bridge being built. 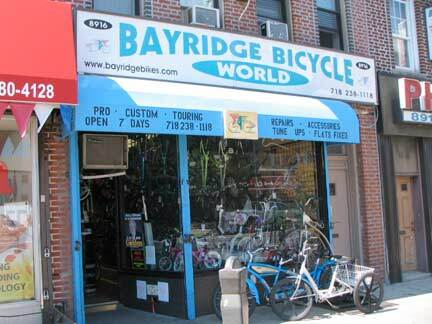 Famed author Gay Talese interviewed Bay Ridge residents and bridge workers in The Bridge. 3rd and Marine Avenues. 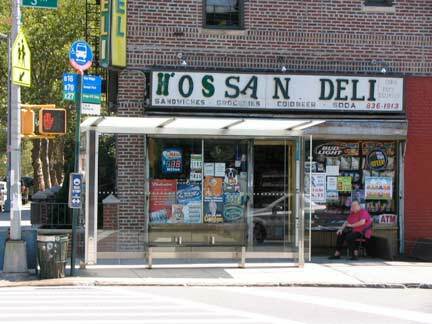 Hossan Deli has a sign that looks like a note a hostage taker sends, with cut-up letters so they can’t recognize your handwriting or identify what printer you may have used. 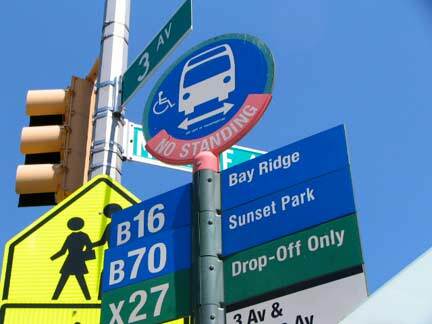 In 2010, the longtime 3rd Avenue bus route, the B37, was eliminated. Other routes have been forced to do extra work to pick up the slack. 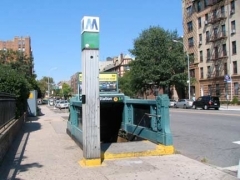 The B70, which once ran straight down 7th Avenue on its way to Veterans Hospital across from the Dyker Park Golf Course, now turns on Bay Ridge Avenue (69th Street), runs down 3rd, Shore Road, 4th Avenue, 92nd Street and then 7th Avenue to the hospital. 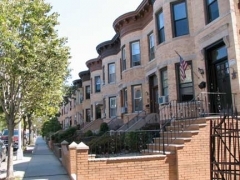 In Boerum Hill and Gowanus, the B103, which runs an incredibly lengthy route from Tillary and Adams Streets to Flatlands and Williams Avenues in Canarsie, plies 3rd Avenue from Flatbush to Prospect Avenues. I have to ride that new route someday! I don’t know much about magnificent 185 Marine Avenue, except its lighthouse-like tower looks out over the Narrows. 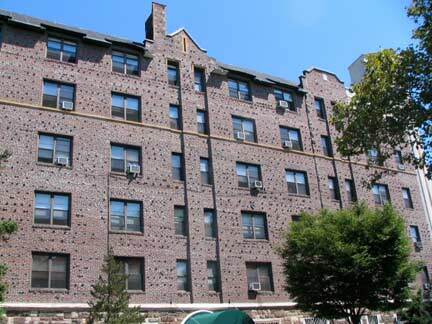 It’s got extraodinarily varied and pointed brickwork. It was completed in 1927. 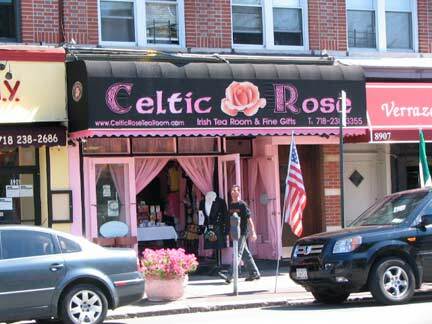 It takes advantage of the pointed corner made possible by Marine Avenue’s turn to the northwest. Apartment building, NE corner 3rd and Marine Avenues. Another look at 185 Marine. 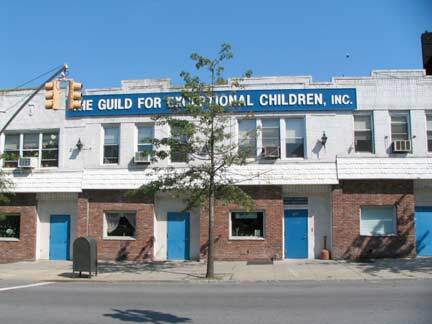 The title of Thursday’s Child, a day care center at 220 Marine and 3rd Avenue, comes from a nursery rhyme first recorded in 1838. 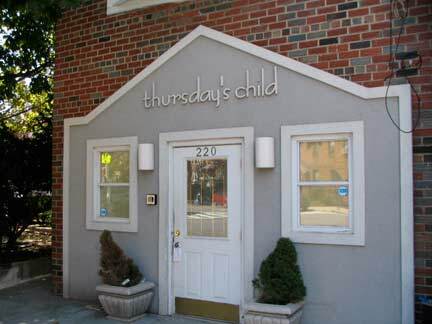 According to the rhyme, “Thursday’s child has far to go.” Your webmaster was a Thursday child. The title has been used in a David Bowie song and an autobiography by Eartha Kitt. 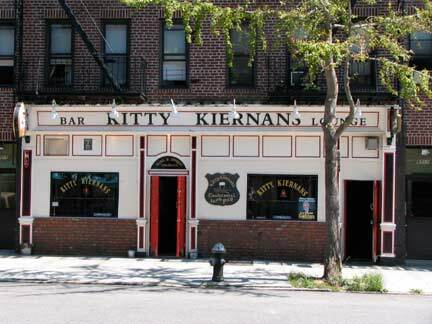 Kitty Kiernan, for whom the bar across the street was named, was the fiancée of assassinated Irish revolutionary Michael Collins, regarded as a key figure in the creation of the Irish Free State. 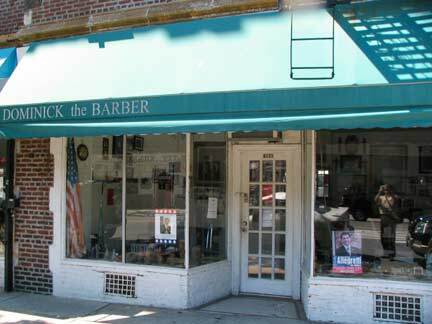 “Dominick the Barber,” 3rd Avenue near 97th. 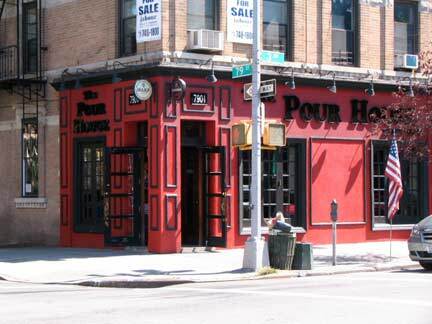 Third Avenue for the most part boasts local businesses and mom and pops. 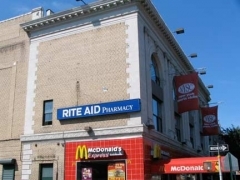 A Walgreen’s replaced the local Key Food, and there are a Starbucks and a Subway further north, but the big chains have stuck their beaks elsewhere. 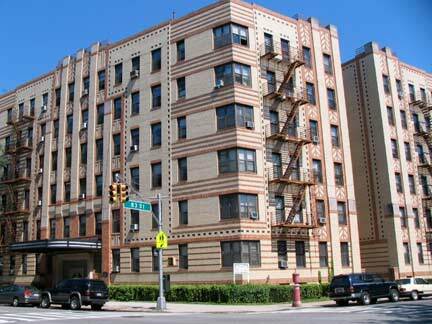 Yet another magnificent apartment house, this one on 96th Street. 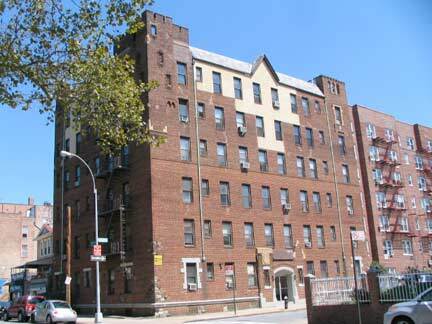 In the late 1980s I sought an apartment here, and I was shown an apartment with a bridge view. But the landlord did not want a 30-year old single man in the place. 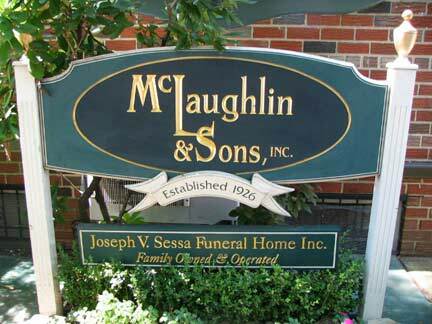 McLaughlin Funeral Home, 3rd Avenue and 97th Street. Both my mother (1974) and father (2003) were waked here. 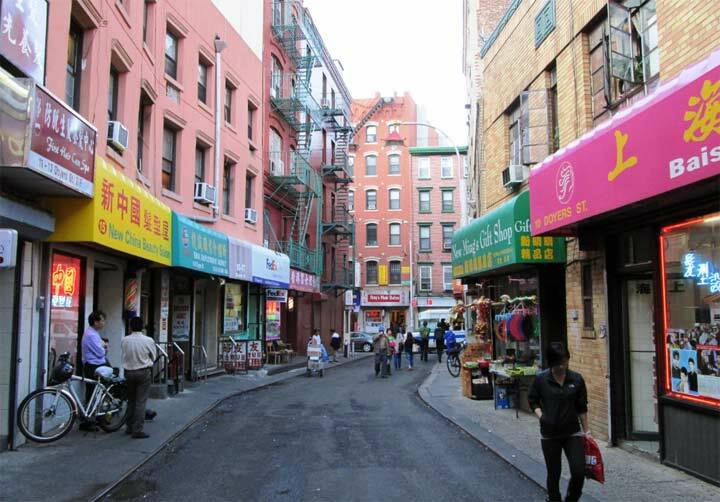 Forgive the occasional nostalgic indulgence — 3rd Avenue was a big part of my life from 1957-1993. 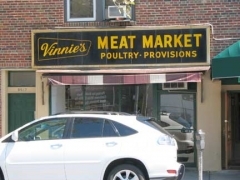 Around 95th Street: Vintage meat market sign; Ballybunion’s, where the bike I had U-locked on a no parking sign post was stolen in 1986; a magnificent Tudor apartment building with unusual stone and wood-log fence. 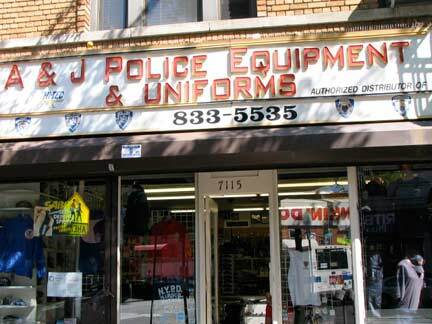 My father patronized the camera shop on the ground floor. Ballybun(n)ion is a coastal resort town in County Kerry, Ireland, famed for its golf course. 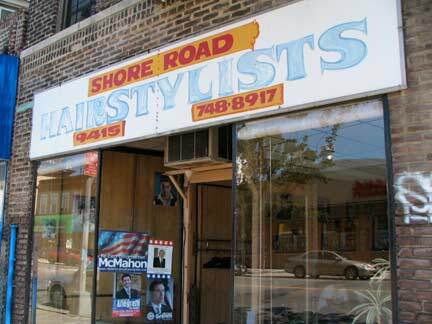 Shore Road Hairstylists has a painted awning sign that was likely new when the Farrah Fawcett Flip was. 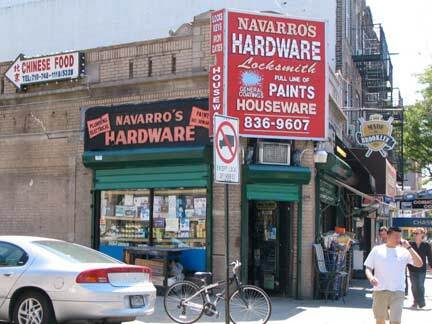 Navarro’s Hardware at 94th Street seems to be of equal vintage. 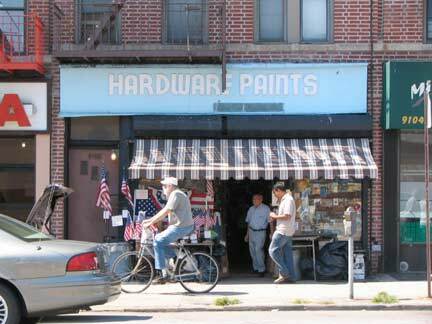 This hardware store looks timeless with its striped awning and woodcut sign. 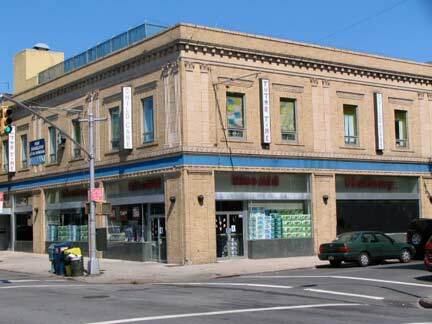 Note that the architecture on 3rd Avenue seems a bit older than that on Bay Ridge’s other main avenues — visual proof that this main north-south route was established before the rest. 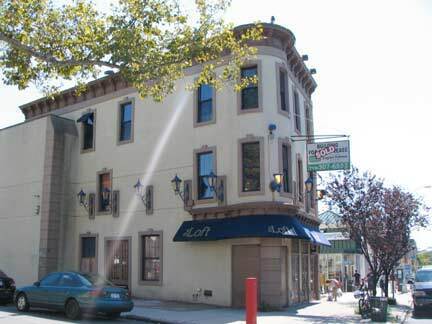 The building on the left at 91st Street has been home to a succession of restaurants as long as I remember; the latest one, The Loft, apparently a failure. 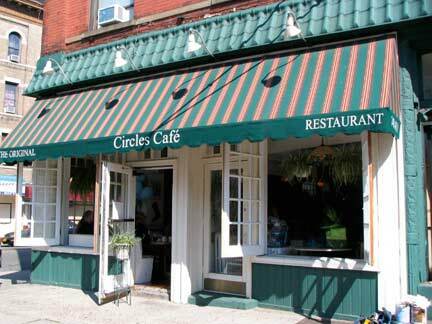 One of two Circles restaurants on 3rd Avenue and one of three in Bay Ridge. 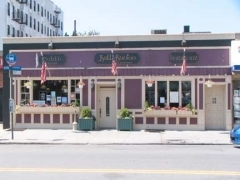 (Reviews are decidedly mixed; I’ve liked the meals I have had there). 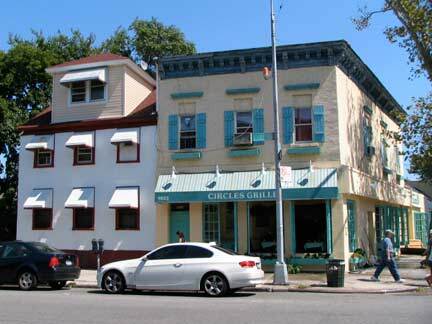 Both of the buildings in this photo are grand old campaigners that might go back to the 1800s. 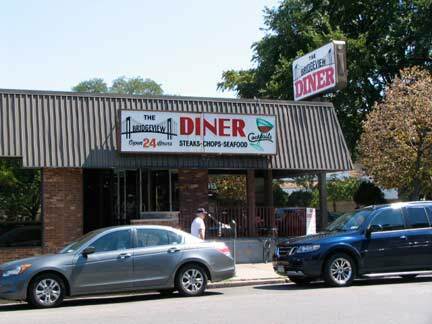 The Bridgeview Diner is where the postgame show for FNY’s marathon 5-hour Bay Ridge tour took place in the spring of 2005. 90th Street and 3rd Avenue was near the center of old Fort Hamilton village. Walk down 90th and you’ll see some very old bungalow-like homes as well as Forest Place, which in my memory was still a dirt road. 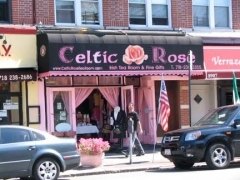 This building’s ground floor door and display window are nearly the same as when I was a Bay ridge resident. 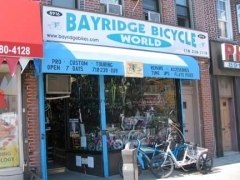 Bay Ridge Bicycle World was your webmaster’s bike repair and sales shop of choice when I was a Bay Ridger. They sold me the Motobecane I bought after my previous bike was stolen in 1986 at Ballybunion. (I still have it — only 1 gear works now and I really should get a new bike). 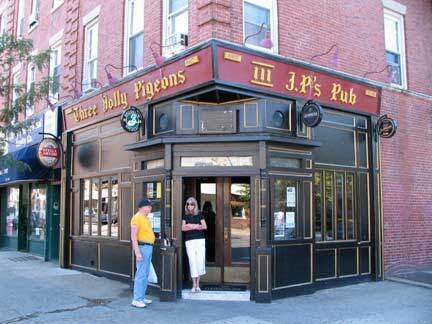 It’s been said that there’s a bar on every corner in Bay Ridge and on 3rd Avenue the adage is almost true. 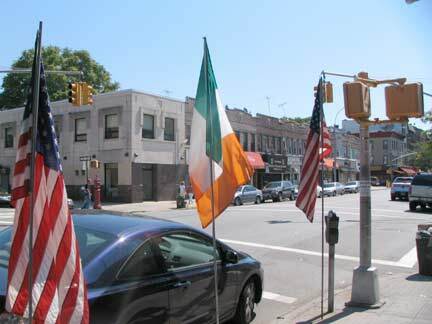 Irish presence is especially thick in this stretch and I spotted some Irish flags here and there. You really know your neighborhood when you work for your local newspaper. 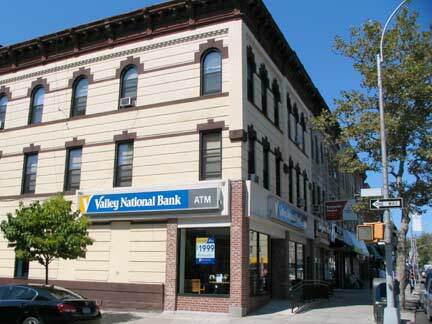 I worked for my local Times Ledger chain in Queens for 13 years between 1996 and 2009. 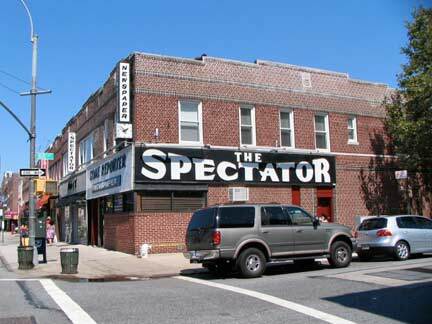 I never did work for The Spectator and Home Reporter, two of the three local Bay Ridge newspapers (the Bay Ridge Paper is the other) but I picked up one or the other each week for many years. 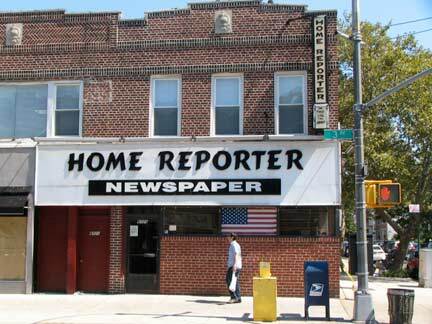 The papers’ office is in 3rd and 87th and the facades here match the paper’s masthead treatments, which each has used since time immemorial. Passing the House of Squid at 86th Street. 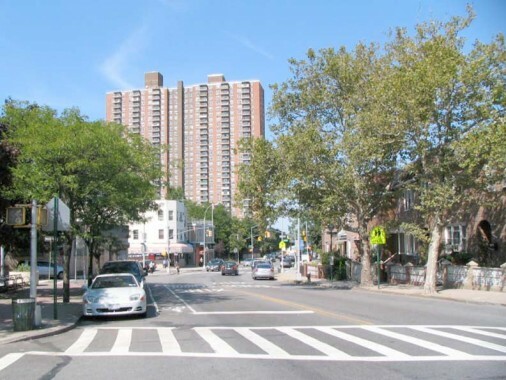 This is the main east-west shopping street in Bay Ridge between 4th Avenue and Fort Hamilton Parkway, but from 4th to Shore Road it’s an extra-wide residential strip. On the 1873 map shown above, 86th Street is shown, but it was not yet laid out. 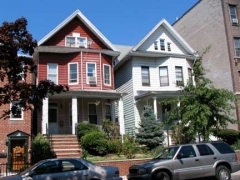 It’s one of the most important of south Brooklyn’s numbered streets, running straight as a string from Shore Road to McDonald Avenue and Avenue X in Gravesend. 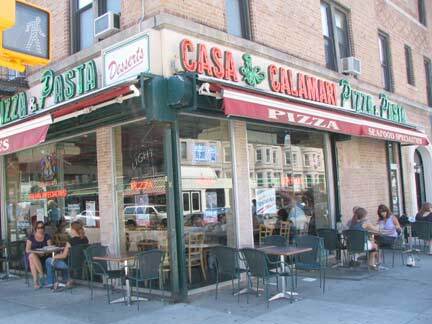 Coincidentally Manhattan has a prominent East and West 86th Street as well. 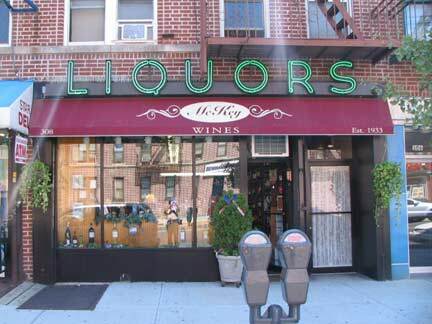 Here’s yet another venerable neon liquor store sign, which NYC has in abundance. 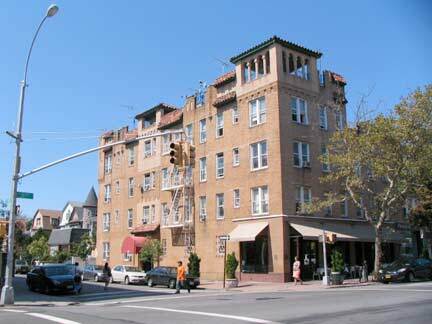 Yet another of Bay Ridge’s singular apartment buildings, with watchtower-like features, on 85th Street. 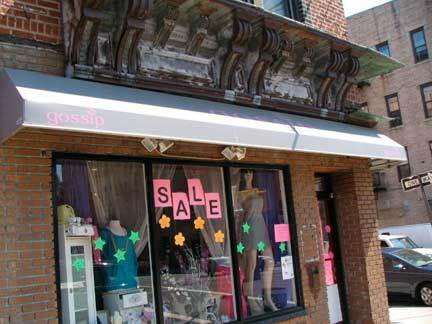 RIGHT: the dress shop at the corner of 84th Street used to be the Soup As Art restaurant, owned and operated by Joseph R. Gannascoli of The Sopranos fame. 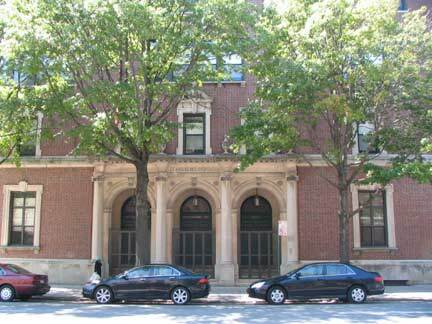 I made a quick detour down 83rd Street to see my old school. 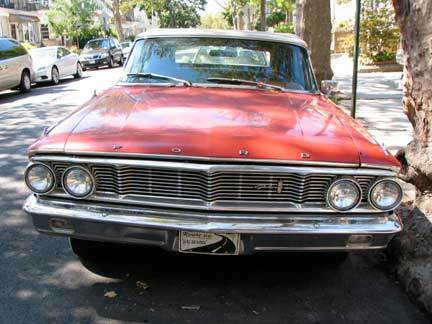 On the way, I spotted a Ford Galaxie 500. The car was produced every year from 1959 to 1974. What year is this model? 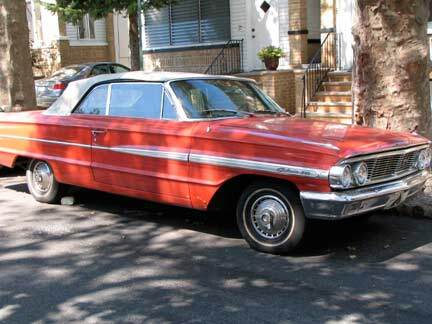 I went with my mother and grandmother to Glendora, California ( a suburb of LA) to visit my aunt and uncle in 1962, and even from this remove, I remembered the Galaxie as my uncle’s vehicle of choice. Looks like a 1964 model. 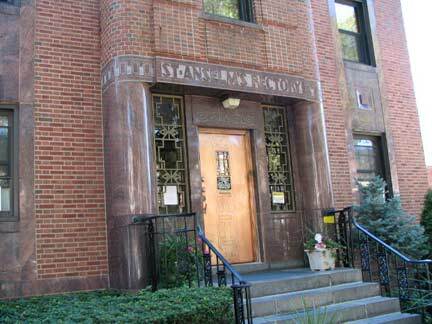 At 4th Avenue and 83rd Street is the Catholic parish of my youth, St. Anselm. The parish was established in 1923, with the original church building and sacristy contained within the school building (upper left). 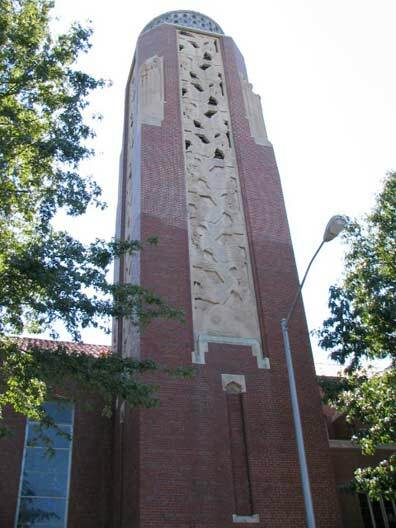 The present church and campanile was completed in 1954. The rectory, on 82nd Street, bears Art Deco touches. The church was named for the Northern Italian Archbishop of Canterbury from 1093-1109. He preceded Thomas Aquinas as one of the Church’s foremost intellectuals. 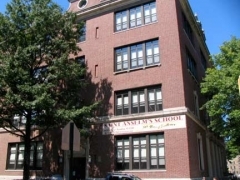 I spent mostly every day of my life between 1963-1971 in the school building and, since I was an altar boy, a lot of time in the church as well. My experience was decidedly mixed; while the priests, to a man, were exemplars and examples of how life is to be lived, my time at the school was mostly a downer, especially in later years. I simply felt I was not treated with the human dignity I deserved by the students who kicked me down staircases or by nuns who ripped up my magazines, and I haven’t set foot in the school since my graduation June 17, 1971. I attended the church regularly and maintained friendships with the priests for a long time afterward, however. It’s gratifying how the space of years gives you the opportunity to look at things afresh, with seemingly a new pair of eyes. 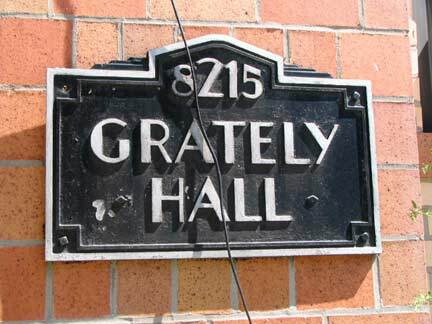 All the time I passed by Grately Hall, across 4th Avenue from the school, I never considered it a masterpiece of architecture. Seeing it again, I can note that it’s maintained many of its original Art Deco touches. 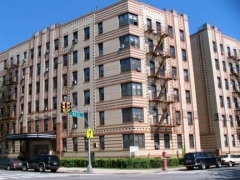 4th Avenue’s collection of apartment buildings sprung up in the building boom of the late 1920s and even continued in the Depression days of the 1930s. 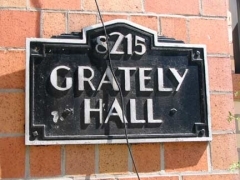 When I was going to school here, the building was a pup of only about 30 years of age. 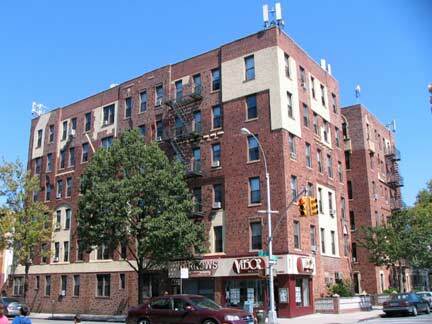 Another pair of handsome apartment houses on 3rd Avenue and 81st Street. 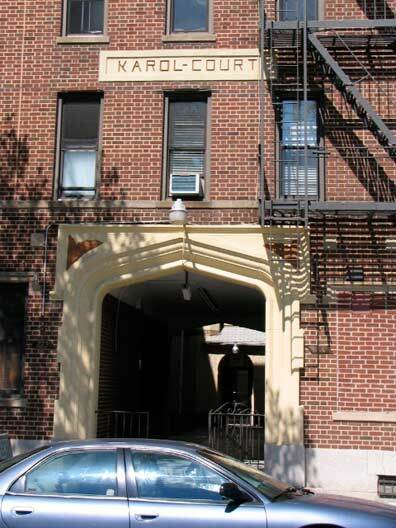 When an apartment house is given a name it usually appears over the front entrance; in this case, Karol Court is carved above the 2nd floor windows. At right, the effect is somewhat compromised by that 21st Century bane, cell phone relayers. 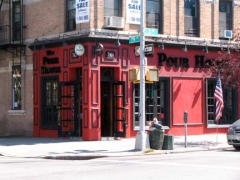 As the 1913 photo demonstrates (image courtesy Brian Merlis and Lee Rosenzweig’s Bay Ridge and Fort Hamilton: A Photographic Journey), there has been a tavern on the SE corner of 3rd Avenue and 79th Street for many decades; the Pour House and its ancient neon sign are there today. 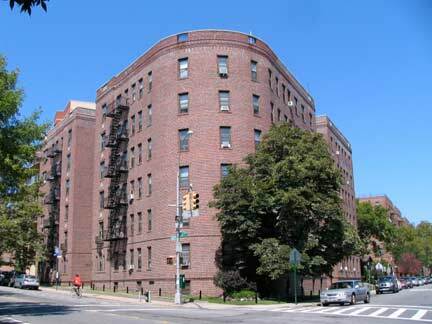 Across 79th Street is a 2-story brick building that replaced the low wood-frame houses likely oin the 1930s. For most of its existence it served as a garage; in 1977’s Saturday Night Fever, Tony Manero and his friends rumbled against a rival gang here. 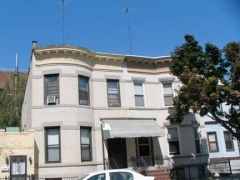 Manero and his family were depicted living in a house at 221 79th, a half block away. 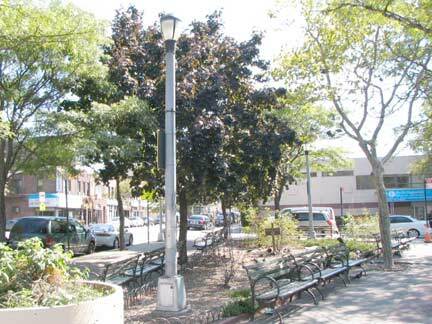 Note the gaslamp with 79th Street sign. Most of the buildings on the left in the picture are still there. 3rd Avenue and 78th Street. Buildings on each side of the avenue were built about 1905. 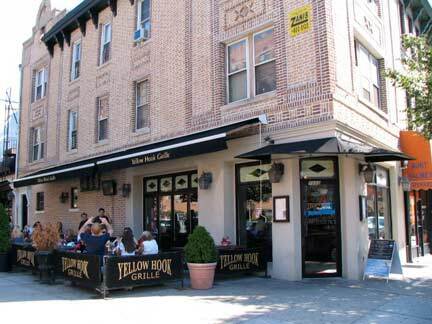 At right, the NW corner formerly featured a tavern called Griswold’s, where my father and I would meet for his birthday each year for several years. It’s now a bank but at least the pleasing 1905 esthetic is still there. 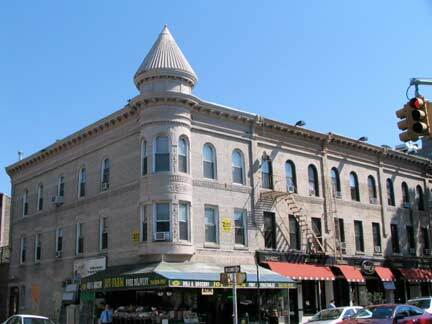 I strayed away from 3rd Avenue once again on 78th Street, one of my favorite Bay Ridge blocks. Something for everyone here: attached stone houses, brick apartment buildings, an American Legion hall, even some stucco. 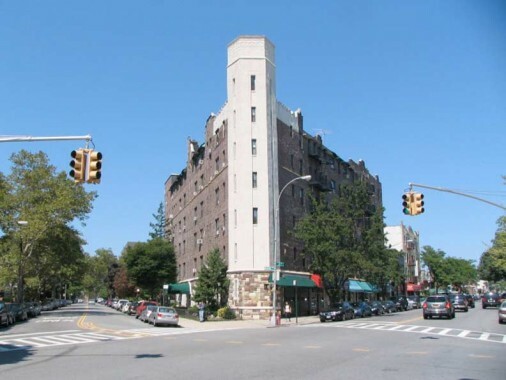 The Claflin Funeral Home takes up the NW corner at 4th and 78th, facing another magnificent apartment building marred by not-so-magnificent cellphone relayers. 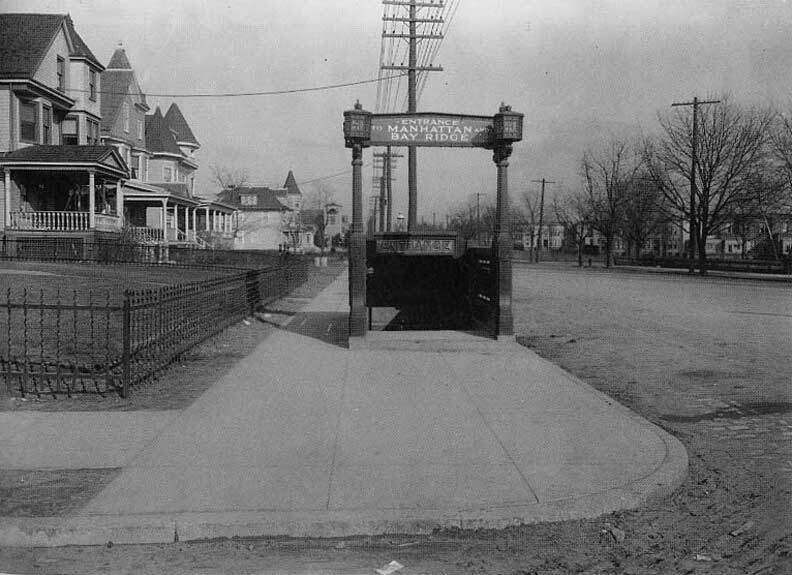 The older photo shows the subway entrance of the 77th Street BMT line (R) on 4th Avenue shortly after it opened in 1915. It’s still there today, long after most examples of this vintage have been replaced. 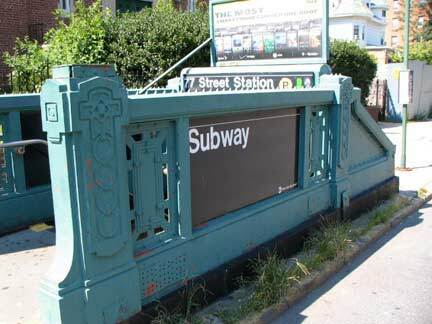 The picturesque sign and lanterns have vanished (and a modern 1970s-vintage MTA lamp installed). 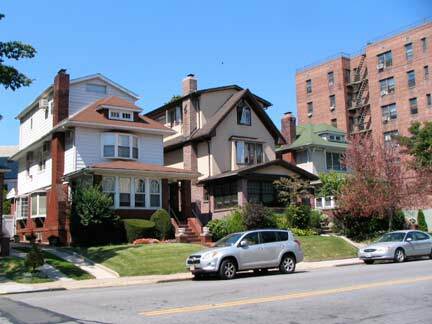 Some of the houses in the 1915 picture are still there, but note that there are empty lots where the apartment buildings will be. 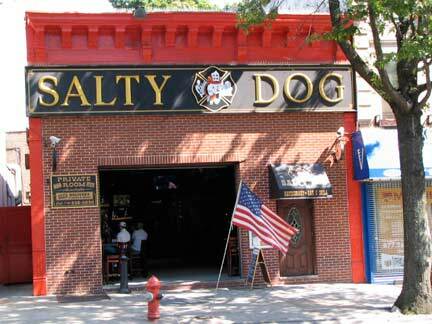 The Salty Dog, 3rd Avenue off Bay Ridge Parkway (75th Street) was once known as the Brooklyn Dodger, but the LA Dodgers brought suit and hence, the name change. 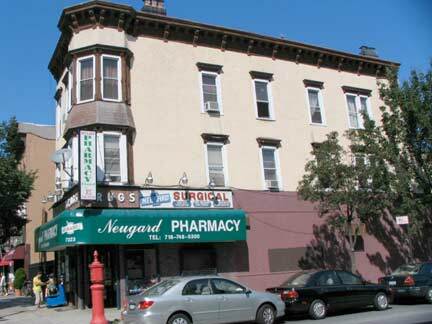 Neugard Pharmacy, 74th and 3rd. 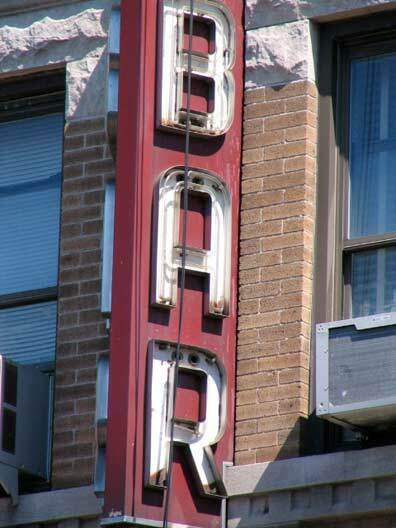 Some of its older sign can be seen peeking above the awning sign. 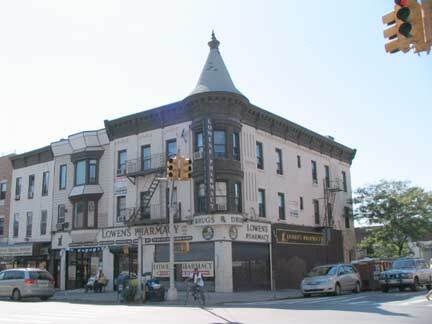 As stated earlier, 3rd Avenue between 60th and 79th was the first portion to be straightened and improved from the Gowanus Road era, and there are plenty of examples of older architecture. 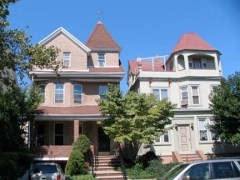 Corner turrets were big in the 1880s. 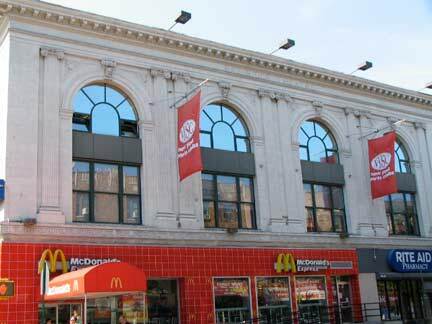 The Bay Ridge Theater building, 3rd Avenue and 72nd street, has survived nearly intact from its days as an actual theater. Here’s a 1968 view when it was a bingo hall. That year there was a karate dojo on the top floor hat has since been repalced by a gym. 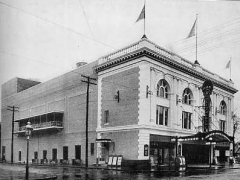 The theater was constructed in 1915, same time asthe 4th Avenue BMT line a block away. The Ovington family owned a farm in the vicinity in the 1840s. 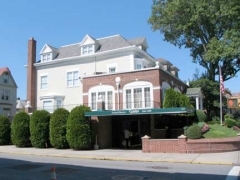 Henry Alexander Ovington, who bought the property for use as a summer home, was the assistant chamberlain of New York City. 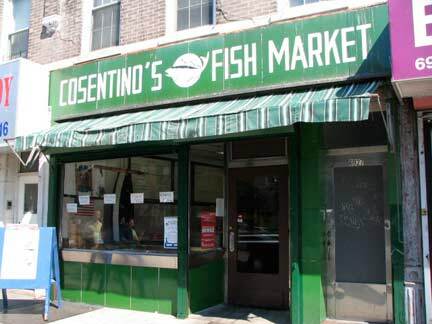 Three of his sons owned Ovington Brothers, a china shop on Fulton Street whose name can still be found on vintage crockery. Another son, Earle, was the first air mail pilot employed by the U.S. Post Office. However, the most famous member of the Ovington family was Mary White Ovington, a co-founder of the National Association for the Advancement of Colored People (NAACP), and a moving spirit behind the Niagara Movement. The history of the area is not limited to the annals of the Ovington family. Rather, the intersection of 3rd Avenue and Ovington Avenue was the site of a skirmish between colonial forces and British troops a few days prior to the 1776 Battle of Brooklyn. 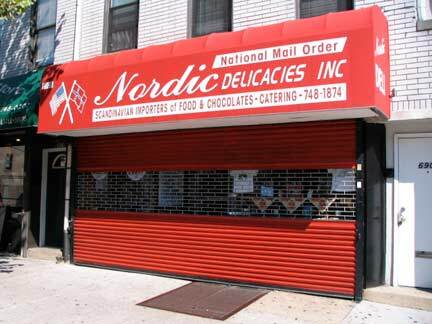 3rd Avenue psychedelia, and a remnant of the neighborhood’s Scandinavian culture. 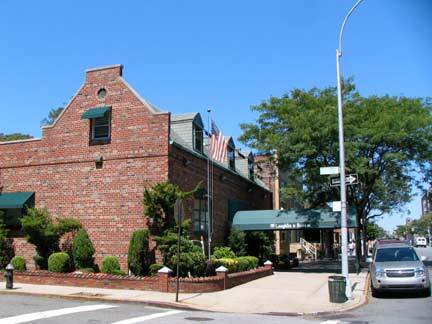 The second of two Circles restaurants on 3rd Avenue, at Bay Ridge Avenue (69th Street). There has been a pharmacist on the SW corner of 3rd and 69th for over a century. is a non-profit organization dedicated to addressing the needs of children and adults with developmental disabilities and their families. Since 1958, the GEC has provided homes, early childhood education, jobs and support services. View of 3rd Avenue north from 67th Street in 2010 and in 1944. The trolley line is likely the #34, Bay Ridge Avenue line, which was in operation until 1949. 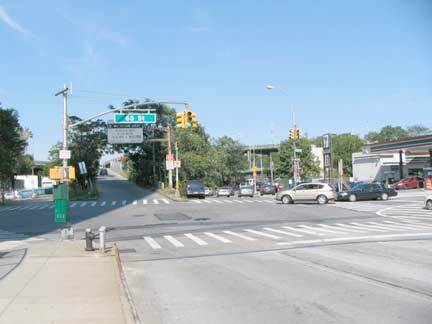 Look closely and a few blocks ahead, you can see the on-ramp for the Gowanus Parkway, built in 1940 as a connection from the Belt Parkway to Hamilton Avenue. It is now part of the Gowanus Expressway. 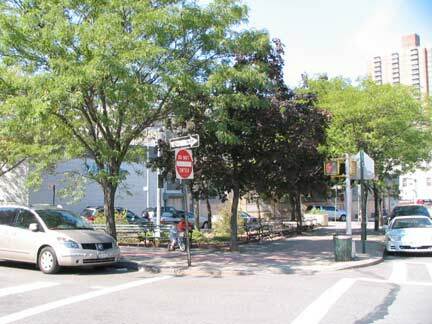 There’s an unusual small park called Stedman Square at 3rd Avenue and Senator Street, where 3rd Avenue has a short tributary branching off. This was a former trolley ramp to the platform of the 65th Street terminal of the old Fifth Avenue El. 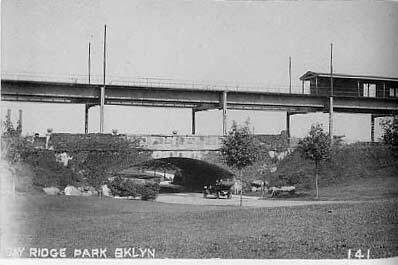 The el can be seen on 3rd Avenue atop an arch spanning what used to be called the Bay Ridge Parkway in 1912. 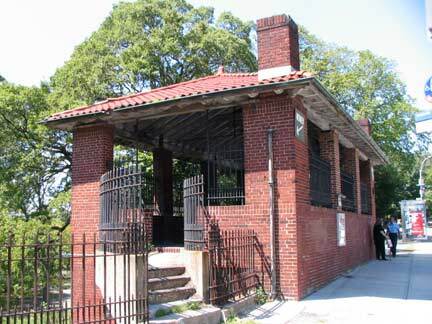 The trolley ramp closed in about 1930, the el closed in 1940 but the parkway, since renamed Shore Road Drive to avoid confusion with 75th Street (officially Bay Ridge Parkway) is still a quick connection from 4th Avenue to the Belt Parkway. 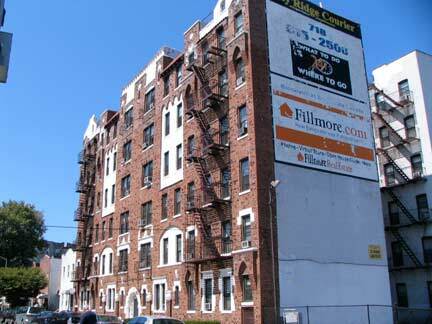 The Bay Ridge Towers are two twin multi-story buildings containing co-op apartments built in the early 1970s. 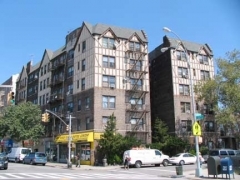 They are the tallest buildings in Bay Ridge, and the upper floors undoubtedly have spectacular views of Staten Island, Manhattan, and beyond. Third Avenue in triplicate. 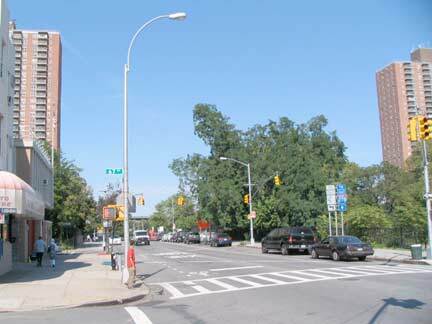 At 65th Street, 3rd Avenue becomes three — at left is the southbound section, in the center the ramp to the Gowanus Expressway, and at right, the northbound section. 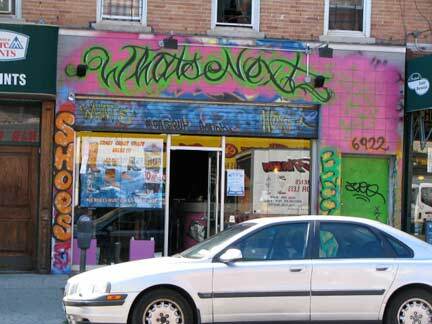 I’ll explore Third Avenue under the Gowanus Expressway in PART 2.